FIFA 17's story mode, The Journey, broke new ground for sports games with its smart balance of in-game action and behind-the-scenes player choices – and now it appears Madden 18 is following suit. "My father used to say: 'when the world knocks you down, get back up again,'" announces a voiceover, as the figure of a young man stares up at the facade of the Indianapolis Colts' Lucas Oil Stadium. 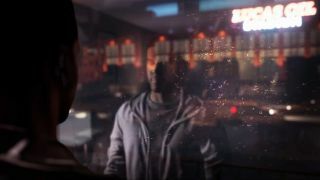 That's it in terms of detail – but with regards to atmosphere, it's near-identical to some brooding moments within Alex Hunter's FIFA 17 story, acted with just the right amount of humility by Adetomiwa Edun. A year ago many would have scoffed at a story mode within Madden, but after The Journey's success, a tale incorporating the draft, free agency, and any opportunity to put one over the Patriots/Cowboys/team you love to hate would be a welcome expansion for ol' Johnboy's Gridiron series. Madden 18 is out for PS4 and Xbox on 25 August. Head here for full release details, including all pre-order bonuses.